Meguiars Last Touch Spray Detailer produces incredible depth, shine and gloss. This spray-on, wipe-off product has a unique blend of polymeric lubricating agents that gently removes dust, fingerprints, smudges and other contaminants, leaving a flawless, showroom shine. 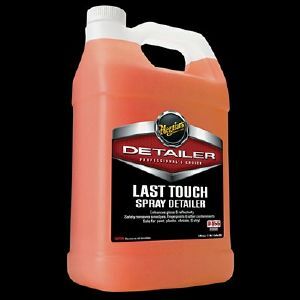 Meguiars last Touch can be diluted 1:1 so is the ideal choice for hobbyist of professional detailer.